Preliminary design plan for Fiscal Year 1913 battleships. This drawing was one of four sent to the Navy’s General Board on 2 March 1911 to illustrate options of interest. 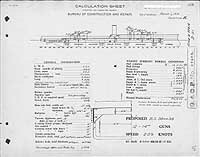 This plan was developed to illustrate the impact of modifying Scheme "G" (see Photo # S-584-010), which met all General Board characteristics goals, by limiting speed to 20.5 knots with reciprocating steam machinery rather than turbines. This plan shows a ship 10 feet shorter and 500 tons lighter than Scheme "G" but that maintained the same armament and protection. 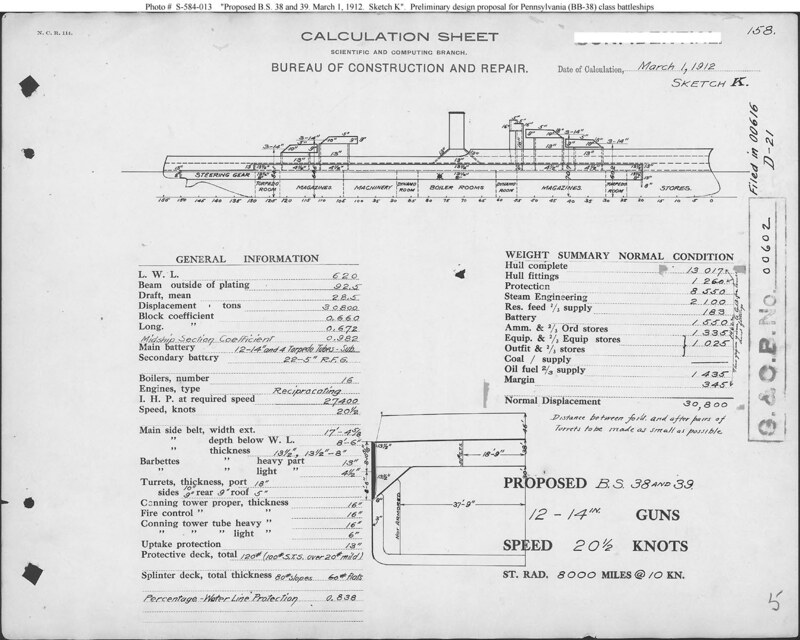 This plan provides twelve 14-inch guns, reciprocating steam machinery, and a speed of 20.5 knots in a ship 620 feet long on the load water line (L.W.L. ), 92.5 feet in beam, with a normal displacement of 30,800 tons.